Here’s another brilliant idea that might help you, or maybe not, but try it out anyway. When we swing a golf club at nothing we make a flawless swing. When we swing at a golf ball, well, that’s a different story, isn’t it? The ball makes us do crazy things and we just can’t help ourselves. Here’s this week’s expert advice guaranteed to solve that problem. Don’t look at the ball when you’re swinging to hit it. Look somewhere else. If you’re hitting an iron from the fairway, you know you’re trying to hit ball first, ground second. So be looking at a spot perhaps an inch in front of the ball. Hit that spot with the leading edge of your iron and you will make outstanding contact. Fairway wood? Same thing. Look at a spot on the ground an inch or so ahead of the ball. There’s a trick to it, though. What about balls on tees? Be looking at the spot where the club would hit the ground were the ball not on a tee, and that is about an inch behind the ball. Pitches and chips are a bit different. In these shots, you slide the sole of the club across the top of the grass. So look at the ground underneath the ball. It takes a little imagination to focus on the ground under the ball without noticing the ball, but you can teach yourself to do it. Looking at a different spot does two things: it stops you from being ball-bound, and it helps you aim your stroke to where it should be aimed. No beating down on the ball! And remember, swing with good rhythm and let the handle lead the clubhead. When you play 18 holes, you know you’re going to putt the ball into the hole 18 times. The structure of par assumes you need 36 strokes to get the ball on the green in 18 holes. That’s 54 strokes, guaranteed, every time you play. The questions you need to answer are, what are you doing with the shots from #55 up to your average score? And which of them you can get rid of most easily? Extra putts? Of course there are going to be some. But if there are more than 18 extra, that’s too many. An extra 14 would be nice. Extra swings? Make good contact and hit the ball straight. This isn’t difficult if you get lessons to learn what you’re supposed to be doing. Hint: it might take more than one lesson. Penalty strokes? Keep the ball in bounds and out of water hazards. See above. Extra recovery shots? Hitting out of tall grass, hitting out of trees, all that’s going to happen, so learn to get out of trouble and back in play in ONE shot. Don’t get greedy. Extra chips? One per hole. First chip gets on the green. Close to the hole is better. Extra pitches? One per hole. The green is a HUGE target. 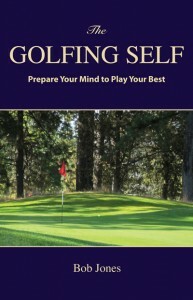 But if you aren’t good enough yet to hit it on the fly every time, hit a pitch and run with an 8-iron. Even if you can hit it on the fly, if the pin is sitting right in front of you and there is good ground between it and you, go with the 8-iron. Extra sand shots? The pros say this is the easiest shot in golf. It is, but it’s a lot like learning to ride a bicycle. Get a lesson and practice. Once you know how to do it, it’s the easiest shot in golf. 1. This winter, go to the range twice a week. Get a small bucket. Hit half the balls with a full swing, and use the other half for pitches from 50-100 yards. It’s likely that the balls will be cold and not go as far as you expect. All that (~30 shots) should take about 15 minutes. 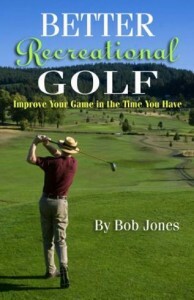 Spend 45 minutes on the practice green hitting chips and approach putts. Practice short putts at home. 2. 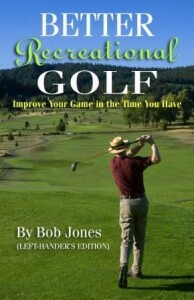 Get a lesson to find out how to put the ball in the fairway off the tee if this is a problem for you. If you normally hit less than ten of fourteen fairways, it’s a problem. You carry a driver and a fairway wood or two, maybe a few hybrid irons, six or so irons, a few wedges—and one putter. Why only one putter? Well, up to the green, we need all those clubs because all the shots we need to play are different. But once we get the ball on the putting green, all the strokes are the same, aren’t they? There are two kinds of putts. There are the long ones that you only want to get close to the hole, and there are the short ones you think you can sink. You not only plan each kind of putt differently, if you examine your putting carefully, you will find that you hit them differently, too. That is why you need two putters. They need to be putters with a difference. Any old two won’t do. The difference has to do with balance. If you balance your putter shaft on your hand, you will probably see that the shaft rotates so the toe of the putter points to the ground. If so, you’re holding a toe-balanced putter (bottom in photo). But there is another kind of putter which, if you apply the same test, ends up with the toe of the putter pointing straight to the side and the face facing the sky. 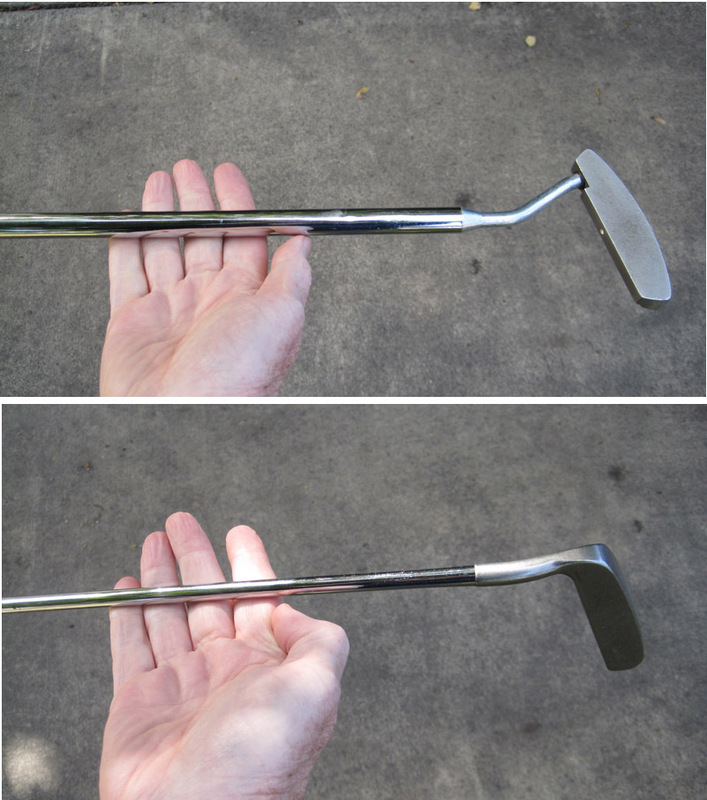 This is a face-balanced putter (top in photo). You might have read about whether your putting stroke should take the putter back on a straight line or on an arc. There are proponents of both schools. The fact is, a toe-balanced putter naturally swings on an arc, and a face-balanced putter naturally swings straight. So you don’t have do to do anything. Just pick the right putter and use your normal putting stroke to get one result or the other. Now, here’s the point. Approach putts hit from a distance need power supplied by an arcing stroke which allows us to move freely as our bodies are built to. That calls for a toe-balanced putter. Short putts, where direction is paramount, are better struck with a shorter stroke that stays on line from start to finish, which gives greater assurance to the putter face being square to the starting line when the ball is hit. Enter the face-balanced putter. So if I told you all you have do to save three shots per round is to take out one club (probably one of your longer clubs) and put in a second putter, would you do it? I did, and that’s why I’m writing this post.